God knows everything about you. Even on your worst day He still loves you. Live life with joy because everything else is uncertain. The secret to a happy life is giving God the first part of your day, the first priority to every decision, and the first place in your heart because God has been faithful in the past, you can trust Him with your future! Don’t ask God to guide your steps if you aren’t willing to move your feet! Sometimes the people around you won’t understand your journey. They don’t need to, it’s not for them! At a roundtable discussion about reconciliation, one participant wisely said, “Don’t freeze people in time.” He observed how we tend to remember mistakes people make and never grant them the opportunity to change. There are so many moments in Peter’s life when God could have “frozen” him in time. But He never did. Peter—the impulsive disciple—“corrected” Jesus, earning a sharp rebuke from the Lord (Matthew 16:21–23). He famously denied Christ (John 18:15–27), only to be restored later (21:15–19). And he once contributed to racial divisions within the church. The issue arose when Peter (also called Cephas) had separated himself from the Gentiles (Galatians 2:11–12). Only recently he associated freely with them. But some Jews arrived who insisted that circumcision was required for believers in Christ, so Peter began avoiding the uncircumcised Gentiles. This marked a dangerous return to the law of Moses. Paul called Peter’s behavior “hypocrisy” (v. 13). Be a use of Paul’s bold confrontation, the issue was resolved. Peter went on to serve God in the beautiful spirit of unity He intends for us. No one needs to remain frozen in their worst moments. In God’s grace we can embrace each other, learn from each other, confront each other when it’s necessary, and grow together in His love. Lord, draw us close to You today, so that we may also be closer to each other. Protect Your church’s unity. Give us understanding where there is distrust. Heal us where we are divided. Galatians 2 offers a compelling example of necessary confrontation. First, Paul’s confrontation of Peter was rooted on the foundation of the truth of the gospel. Paul chose to confront not because of personal dislike but out of love for the gospel. Paul recognized that Peter’s behavior—refusing to fellowship with those who were not obeying Old Testament ceremonial law—denied the good news that Christ’s victory, not ceremonial law, is the foundation for the believer’s new life in the Spirit (v. 21). Peter’s behavior denied the good news that in Christ there is equality among all believers. So Paul confronted, not to shame Peter but to restore the integrity of the faith community. When bad behavior threatens the integrity of the Christian community’s witness to the good news, we too must confront—but always with a spirit of love that hopes for full restoration of fellowship.Is there someone you need to confront in the spirit of love? From the verse above, we observe that first, the Gospel of Jesus Christ—the Word of God concerning Jesus Christ, and the salvation that He brought—is the power of God to save men. His power to bring those who believe out of sin, into the life of righteousness, is encapsulated in the Gospel of His grace. There’s no other way to learn about, receive, or understand the righteousness of God outside the Gospel. Then, in 2 Timothy 1:10, the Apostle Paul shares another inspiring thought: through the Gospel, life and immortality have been brought to light. What kind of life is he referring to? It’s the divine life; the God-type of life; the life that makes men sons of God, and this life is in Jesus Christ: “…this life is in His Son. He that hath the Son hath life; and he that hath not the Son of God hath not life” (1 John 5:11-12). Being born again, we haven’t only become righteous, but have also become the unveiling of God’s righteousness. 2 Corinthians 5:21 says, “For he hath made him to be sin for us, who knew no sin; that we might be made the righteousness of God in him.” Righteousness has become the character of your spirit. The ability to be right, and to do right—the ability to perform righteousness—is inherent in your spirit. You can live that life of righteousness, the nature of rightness that God has given you, from inside out. Furthermore, you have, and can live the transcendent life; the overcoming life that makes us superior to Satan, darkness, disease, sickness, failure, defeat, and death; a life that’s beyond this world! This extraordinary life, along with the gift of righteousness, was delivered to us in Christ, through the Gospel. Not that alone, John 3:15-17 says , “ That whosoever believeth in him should not perish, but have eternal life. 16 For God so loved the world, that he gave his only begotten Son, that whosoever believeth in him should not perish, but have everlasting life. 17 For God sent not his Son into the world to condemn the world; but that the world through him might be saved. Romans 5:17-21 For if by one man's offence death reigned by one; much more they which receive abundance of grace and of the gift of righteousness shall reign in life by one, Jesus Christ. 18 Therefore as by the offence of one [judgment came] upon all men to condemnation; even so by the righteousness of one [the free gift came] upon all men unto justification of life. 19 For as by one man's disobedience many were made sinners, so by the obedience of one shall many be made righteous. 20 Moreover the law entered, that the offence might abound. But where sin abounded, grace did much more abound: 21 That as sin hath reigned unto death, even so might grace reign through righteousness unto eternal life by Jesus Christ our Lord. Also, John 10:11-18 says, “I am the good shepherd: the good shepherd giveth his life for the sheep. But he that is an hireling, and not the shepherd, whose own the sheep are not, seeth the wolf coming, and leaveth the sheep, and fleeth: and the wolf catcheth them, and scattereth the sheep.The hireling fleeth, because he is an hireling, and careth not for the sheep. I am the good shepherd, and know my sheep, and am known of mine. As the Father knoweth me, even so know I the Father: and I lay down my life for the sheep. And other sheep I have, which are not of this fold: them also I must bring, and they shall hear my voice; and there shall be one fold and one shepherd. Therefore doth my Father love me, because I lay down my life, that I might take it again.No man taketh it from me, but I lay it down of myself. I have power to take it again. This commandment have I received of my Father." Now, Jesus is speaking and saying His sheep know Him and He knows them. So, He knows all the little details of our lives. He knows our every thought, our needs, our worries, our fears; He knows everything about us because we were created by God before we came to the Earth. In John 4:9-17, we see Jesus speaking to the Samaritan woman at the well. Jesus is speaking to her and ask her for a drink. Jesus knew the details of her life. Jesus tells her that whoever drinks the water that He gives shall never thirst because He gives the water of everlasting life. Jesus knew of her life of having five husbands and is living with another man who is not her husband. Jesus knew the details of her life. Even though she was a Samaritan and He was a Jew, He was willing to give her the living water. He convinced her that He is the living God. He didn't discriminate against her because He is loving, fair and just. In Mark 4:35-41, we see a great storm arose while Jesus and the disciples were in a ship in the sea. The disciples were still fearful even though Jesus was in the ship with them. They were saying that He wasn't paying attention and that He didn't care if they perished in the storm. But Jesus knew what was going on and He was in control. He rebuked the wind and said unto the sea, "Peace be still and the wind ceased and all was calm. The disciples didn't have faith even though Jesus was right there with them. Jesus knew what was going on and He was in control. There is never a need to fear because God is always with you. Going through Mark 16:4-8 which says, “ And when they looked, they saw that the stone was rolled away: for it was very great. And entering into the sepulchre, they saw a young man sitting on the right side, clothed in a long white garment; and they were affrighted. And He saith unto them, Be not affrighted: Ye seek Jesus of Nazareth, which was crucified: he is risen; he is not here: behold the place where they laid him. But go your way, tell his disciples and Peter that he goeth before you into Galilee: there shall ye see him, as he said unto you.And they went out quickly, and fled from the sepulchre; for they trembled and were amazed: neither said they any thing to any man; for they were afraid." They didn't deliver the message the angel told them to tell the disciples because they were fearful. Peter who denied Christ three times, was accepted back with Him. He forgave Peter. No matter what, He still blesses us and is always with us. No matter what you may ask God for, big or small, He will answer. He neither sleeps nor slumbers. Reading 1 Samuel 16:7; "But the LORD said unto Samuel, Look not on his countenance, or on the height of his stature; because I have refused him: for the LORD seeth not as man seeth; for man looketh on the outward appearance, but the LORD looketh on the heart." There is no need to worry about your outward appearance because Jesus sees you in the image of the Father. He looks at your heart. So guard your heart from all evil and wickedness. The way God looks at us is not the way we look at ourselves. You are sealed and solid in God. There is no need to doubt yourself. The devil cannot steal what has been sealed by the Holy Spirit. (Ephesians 1:13). You have great value to God; you are untouchable and secure in Jesus. Okay there you are, a story was told of a man who have a promising job. With this job, he could rise to a great position in future. But because of the frenetic rush to travel abroad, he forsook his job. On getting there, he could only lay hands on a menial job that only elementary certificate holders could do in his country. He quickly came back to takeover his former employment in his country notwithstanding the years wasted. Today, he occupies a prime position and enjoys blessings he could never have enjoyed in the other country. God told Isaac not to go down to Egypt despite the famine in his state of nativity. In Egypt, even when there was no rain, River Nile was always there to provide water for the lands. Crops grew from time to time despite low precipitation. There was always food when there was famine in other lands. Egypt would have been the best decision for Isaac, but the nation is identified with former way of life. So, God told him not to go. Many times, we are tempted to make decisions like this. Out of expediency, we may be at crossroads, not knowing what next to do. This is the time we need to go to God to direct us in taking the right decision. But we must have a ready mind to hear from God because He will not force His decision on us. We must depend upon him and refuse to lean on our own understanding. God sees the future and knows the end right from the beginning; so, He has reasons for withholding us, or warning us against doing somethings. A willing mind will always have a willing God to direct him. Life is a choice; and what we become later in the future has a lot to do with our personal determination and commitment to the choices we make along that route. 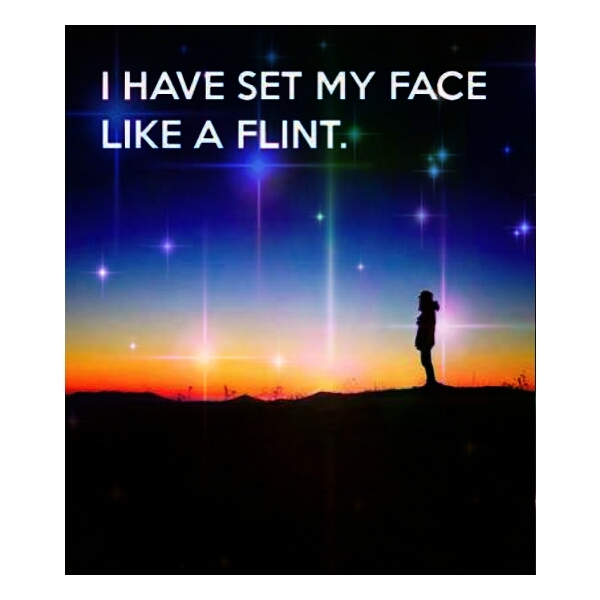 It is instructive for you to be focused and set your face like a flint. A drop of water constantly dripping on a point on a rock soon give way to a depressive mark on the rook due to its persistence. 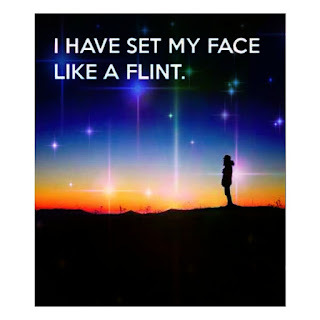 Are you focused and your face set like a flint ? He proposed in his heart, so as not to miss God’s plan for his life (Daniel 1:8). Never allowed distractions to derail him(Acts 20:24). For the joy set before Him, faced the death on the cross (Hebrews 12:2). 1.Seek first the Kingdom of God and His righteousness. 2.Be personally determined to get to your goal. 3.Resist any attempt to deviate from your track. 4.Run to obtain , so that your labour is not in vain. 1. Praise God because He is still leading and guiding His children who care today. 2. Consecrate to surrender to His guidance and confess where you have ignored or neglected His guidance. 3. Ask Him to open your heart and hears so that you will be sensitive to His guidance. 4. Ask God to use circumstances to force you back to His will where you have missed it. 5. Pray for our youths that they will cherish His guidance above all else. 6.Father, please assist me to be focused on the vision for my life. 7.Father,every distraction and hindrance on my way to destiny, please help me remove today. 8.Father,let the joy of eternal Life, overshadow all present earthly sacrifices in Jesus name amen. 9.Father, Grant us grace to jettison every weight and the sin that easily beset us on this journey. 10. Awesome and righteous Father, I thank you for the life of Christ in my spirit that’s made me one with you; your righteousness in me has brought perfection and excellence into my life, causing me to live and do right, walking triumphantly every day! I’m walking in the reality of who I am in Christ, taking full advantage of the power and effect of your divine life in me, in Jesus’ Name. Amen. Sin and Satan and the grave. Land me safe on Canaan’s side. I will ever give to Thee.